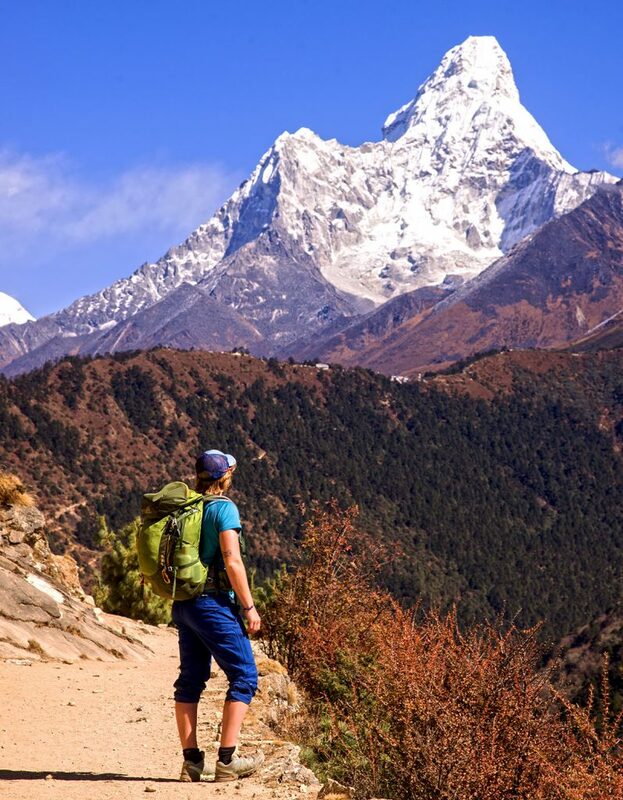 Amadablam is undoubtly one of the most stunningly beautiful mountains in the world and every climbers dream. It is the most impressive peak along the Everest trail. 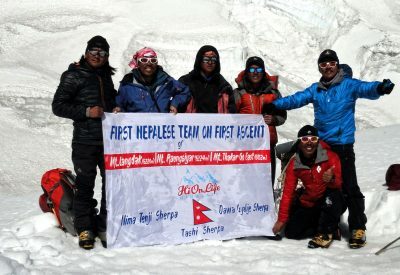 Every person who has trekked in the Everest region has without a doubt taken numerous pictures of this impressive mountain which is the heart of this region. Ama Dablam was first climbed in 1961 by a New Zealand and American team, via the SW Ridge. 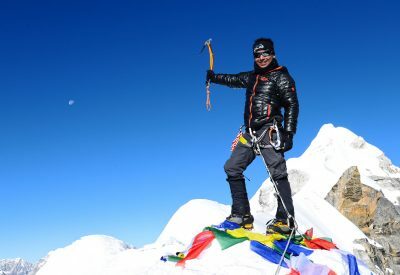 This Expedition offers the summit of this stunningly beautiful mountain along with an ice climbing course on a semi technical trekking peak called Lobuche East (6119 m). Ama Dablam is a technical climb with 5th class rock with a couple of rocky sections of 5.7 at 6000 m +. We ascend via the SW ridge which is an exposed rock ridge dotted with towers and interesting climbing sections. Once established in Base Camp we move to Camp 1 (5,800 m) via a long slope to the bottom of the SW Ridge. The technical climbing begins from here and the route follows a rock ridge to the infamous Yellow Tower, which immediately proceeds to Camp II just above 6000 m. The route from Camp II to Camp III (6280 m) climbs through an exciting mixed rock and ice section via the Grey Couloir. The very exposed nature of the route makes this an exciting climbing. 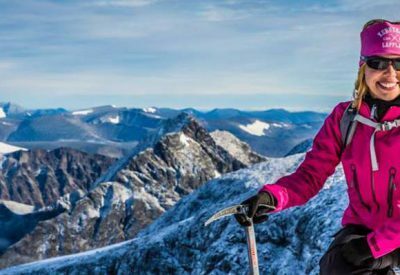 On summit day we climb a steep icy slope, between the ice cliffs then follow a snow crag leading onto the summit. We encourage climbers with moderate technical experience to attempt this route for an experience of a lifetime. However, participants are required to have past rock and steep snow climbing experience on exposed terrain. It is mandatory that our participants are in excellent physical condition. Day 4. Fly to Lukla (2830m) and trek to Benkar (2700m). Day 4. Trek to Namche Bazaar (3440m). Day 5. Rest day at Namche Bazaar. Day 21. Ascend to Camp 1. Day 22. Ascend to Camp 2. • All internal transportation including domestic airfares to Lukla and back. • Services of English or/and Swedish speaking guide. 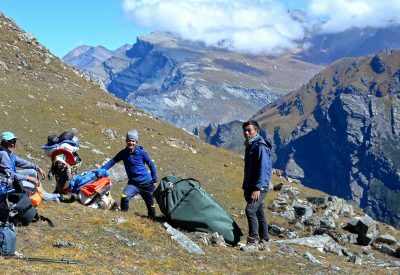 • Porter’s and Sherpa’s assistance. • 5 nights in tourist class hotel on bed and breakfast basis while in Kathmandu. • Lobuche Peak climbing permit. 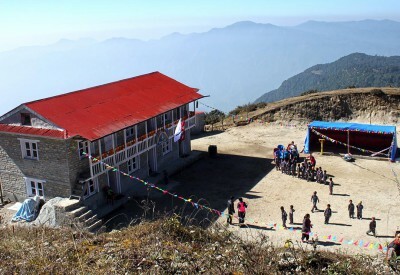 • Full board lodge trek with all meals while on trek. • All camping and kitchen facilities. • All meals while on Base Camp and Advanced Base Camp. • Hilleberg Saivo tents on twin sharing while at higher camps. • Radios and “walkie talkies” and satellite phone for emergency purpose. • Emergency use of Pressure bag (Gamow bag) and medical oxygen cylinders. • Staff insurance, tourist service fee and all taxes applicable as per state law. • Mineral water, beer, soft drinks and extra tea/coffee outside of normal meal times. • Private room accommodation in Kathmandu unless a single supplement is paid. • Optional tips to guides and porters. • 250 USD/ member for Sherpa summit bonus. • International airport departure taxes. • Helicopter evacuation in the unlikely situation, although we do arrange for it and make the necessary documents so that you can claim from your insurance.